Born in 1954 to a military family, Frank was not exposed to pottery until college at Missouri State University. He began making pottery in 1975. In 1981 Frank became a full-time production potter at Silver Dollar City in Branson, Missouri. There he made functional stoneware such as mugs, plates, and bowls. Frank continues to create these functional pieces to this day. His true passion, he found was working with crystalline glazed porcelain. Frank saw his first crystalline glazed piece in Glazes for Special Effects by Herbert Saunders, in the college library. Unfortunately the book, which was out of print, disappeared from the library. Five years later Frank attended a workshop where potter, John Dias, of Arizona, shared the information Frank needed to get started. His love of victorian potter, Adelaide Robineau’s work lead to the addition of cut-work to Frank’s pieces. Frank married Cindy Wilkerson in the fall of 1976. She taught school in Springfield, Missouri, while Frank worked hard to enhance his throwing and piercing skills. They had their first child, Danielle, in 1985, followed by a son, Marc, in 1989. Frank traveled all over the midwest participating in art shows and selling his art in various galleries for over thirty years. Once both his children where grown and Cindy retired from teaching, they decided it was time to get off the road and open a gallery of their own. 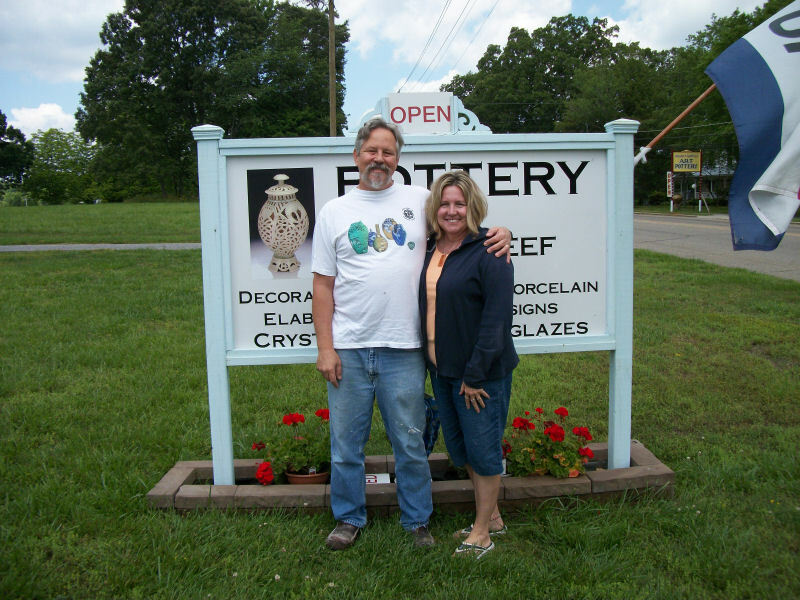 Seagrove, North Carolina, known as a pottery destination,was the ideal choice. They bought the historic Auman house on Main Street. In January of 2010 Frank and Cindy started setting up the gallery in their house, while having a new studio constructed behind the house. The gallery opened in June of 2010. My sister and I visited your gallery last week. What splendid talent you convey through the porcelain crystalline items on offer. We found your pieces to be of breathtaking quality and design. Each piece is beautiful and unique. We will treasure our new pieces and look forward to our planned return to Seagrove this autumn.